Software602's print2PDF application can convert PDF files from any application as it serves as a virtual printer driver for PDF files. 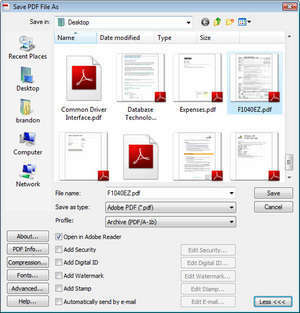 While the interface of Print2PDF might appear to be simple, the program is actually able to do some batch conversion work by converting many types of different documents (like MS Word, Excel) to PDF. The program can also perform handy tasks on PDF files like digitally sign and timestamp them, work as a printer driver at workstations connected to the network and supports MS Office integration. The program also supports web conversion via a SOAP web interface, making it also a simple web-based program on top of its main functions. Version 9.0.11.0107 is a freeware program which does not have restrictions and it's free so it doesn't cost anything. For security reasons, you should also check out the Print2PDF download at LO4D.com which includes virus and malware tests. Additional screenshots of this application download may be available, too. Print2PDF has a presence on social networks. Print2PDF download been highly rated by our users.